Here’s a good deal on charging devices from Amazon! 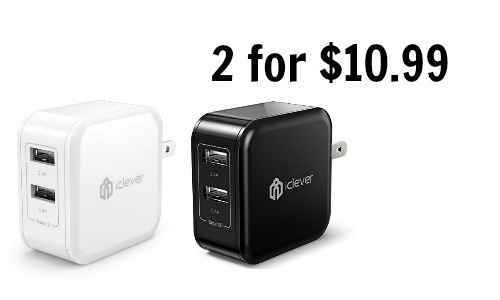 Right now you can get an iClever BoostCube charger for $10.99 (regularly $29.99)! Plus, you can get a second one for FREE! Add the white charger and then add the black version of the charger to your cart and use code DEALTOP1 at checkout. You’ll get both of them for $10.99! These chargers include (2) USB ports and can charge iPhones, Samsungs, and more. This offer is valid for a limited time. Shipping is FREE with Prime or with orders of $49 or more.